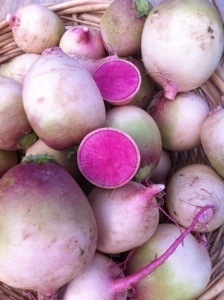 Beauty heart radishes are a large storage radish with off white skin and a beautiful pink center. This color gives the radish two other names, red meat and watermelon, but beauty heart is our favorite name for it! The skin has a typical spicy radish taste, but the pink flesh is wonderfully and surprisingly sweet. We like to grate it on salads, but you could also cube it and roast or stir fry it. Enjoy!